I did a lot of things wrong this week! You can see those things below the linky if you'd like. We had a crazy weekend last weekend and my daughter has been sick all week and my son just got sick also. Okay. What things did I do right???? I'm still drinking my green tea. I'm still remembering to take my vitamins and drink my GreensPlus Superfood Powders. Speaking of which~~we have a GIVEAWAY going on right now for a box of GreensPlus Bars & and GreensPlus Powder of your choice. It's open to US residents who are 18+. You can find the GIVEAWAY here, but hurry! It's a quick one. Giveaway ends 2/24. I'm still eating yogurt with banana and walnuts. Other than that, I need to make it the store and get back on the bandwagon with all of my veggies! I did manage to get some workouts in. These are the DVD and Tape I used this week. Yes, tape. Kickin' it completely old school. I'm surprised our VCR still works! Ha! Saturday: Ran 1/8 mile. Hehe. Sunday: Off. Does cleaning and cooking for 8 hours count? Monday: 50 wall pushups. I just couldn't stand saying that I didn't get a workout in again. So I did 50 wall pushups to say I did something. Tuesday: Shoveled snow for 1 hour. I was afraid I was going to be really sore from that! I'm feeling it a little bit today. So, this past week I worked out 173 minutes. That brings my February total minutes to 420 minutes. My February goal was 700 minutes. So, with 11 days left in February, I need to work out 25 minutes a day for the rest of the month. That sounds so do-able, especially since some of these workouts I've been doing are 50 minutes long. How did you do this week? Let us know in the LINKY below. 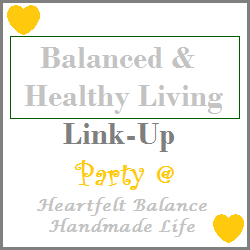 You may also link up any HEALTHY LIVING post that you have~~ posts about NUTRITION, GOING ORGANIC, Healthy Recipes, Working Out, Living a Balanced Life. . . . . you get the idea! We only had 8 posts linked last week. I'll start doing weekly features once we hit 20 links on the linky! For now, you can check out all of the posts at last weeks party here. I try to stop by and read each post that you link and either PIN or Tweet your post! Thank you for linking up! I hope everyone has a BLESSED weekend!!!! It has been such a crazy weird week since the last time I've updated you on my fitness!!! We had a great, fun weekend, but it was full of partying. We had too much fun at the Undie Run. I wimped out and didn't wear just undies because it was 5 degrees outside. They also shortened the run so that we didn't all get frostbite. My friends estimated it to be about 1/8 mile instead of a mile. They just had us run down the street and then turn around and come back. 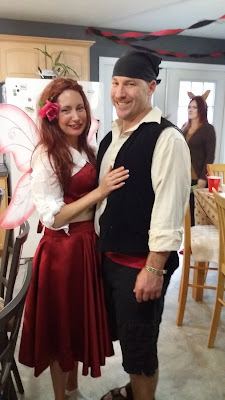 Then I got up at 8:00 on Sunday and started cleaning my house, cooking and decorating for our (now) annual Disney party, where I was Rosetta from Pixie Hollow. Thankfully, we all had Monday off for President's day. Then Tuesday, Wednesday and today I had a little sickie home with me. I hope I don't catch what she has. Blech! My week has been nowhere near where it needed to be. Between skipped workouts, a lot of beer and the fact that Sweetart Jelly beans have finally hit the stores. . . . . I've had an "off" week. I just can't get enough of those jelly beans. It's ridiculous. Mentally, I know how bad they are for me, but I just love them. LOVE them. After I finish my current bag, I hope I have enough willpower to not buy any more. Why don't I just throw the rest of the current bag away? Because. . . . NO!!! I'm only human you guys! Thankfully they only come out at Easter, which kind of only makes me want them more. Sweetart must be marketing geniuses.